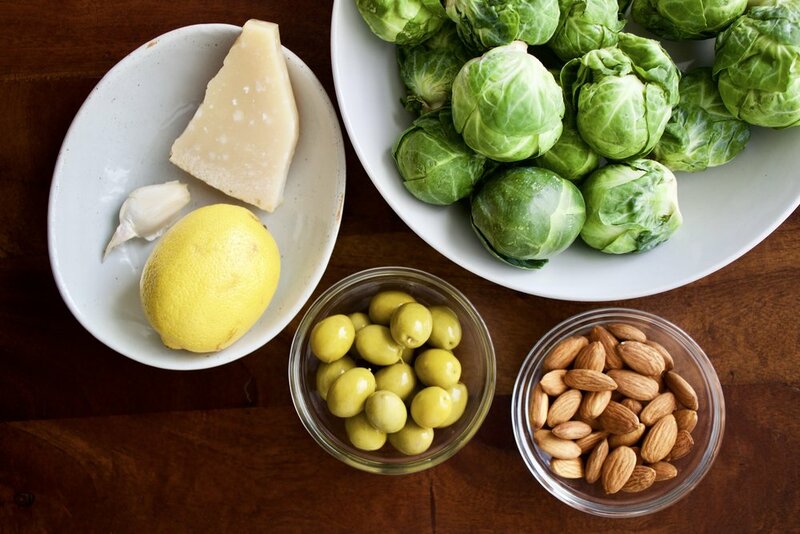 Brussels sprouts are one of those things; people other love them or hate them. I would bet though that the thing people don’t actually like about them is HOW they were cooked. It’s not the sprouts fault! They have some amazing flavors and textures to offer, it’s just that Brussels sprouts must be treated correctly in the kitchen. Whenever I see people converted from haters to lovers, it’s usually when they try undeniably delicious caramelized roasted Bro spros. (I can only type Brussels sprouts so many times, plus Bro spros is so much more fun to say!) Boiled or steamed, they just aren’t anywhere near as magical. We need to work with their bright, pungent, funkiness in a way that properly compliments and contrasts them. This Bro spro dish does just that, and I have faith it can convert some non-believers out there. It’s got rich and salty cracked green olives and shaved Parmesan cheese, nutty almonds, and a fresh and punchy vinaigrette that takes about 4 seconds to make. This is one satisfyingly crunchy salad as you would expect with the almonds and Bro spros. Brussels are in the same family as broccoli, cauliflower, and kale- known as the cruciferous veggie family. These veggies are all pretty strong tasting, and some can be a bit offensive to people with their funky, sometimes bitter flavors. The thing though is that those same compounds responsible for the offensiveness are also the ones that research shows to be effective in fighting cancer. These warrior plant chemicals are called GLUCOSINOLATES. Cruciferous veggies offer you lots more too like fiber for fullness and good gut health, vitamin K for bones and blood clotting, vitamin A for vision and immunity, vitamin C for antioxidants and immunity, electrolytes like potassium, and magnesium for proper muscle function, etc. The question is then not why should you eat them, but how can you eat them. And here’s one delicious way! Aren’t a fan of Bro spros, or haven’t had them prepped raw like this before? Then this is the dish for you to push out of your culinary comfort zone and try something super nutritious and so so yummy. This salad is a refreshing option to get your veggies in this time of year when well-done vegetables seem to be hard to escape. Or, bring it to a holiday meal! This one’s a winter winner for sure. Happy cooking! Shred Brussels sprouts by halving vertically, then cutting crosswise very thinly to create small ribbons. (Don’t cut off the stem-use as a handle to hold when shredding sprouts) Add to a big bowl. If almonds are not already toasted, do so by cooking at 350’F/175’C for ~5 minutes. Then rough chop and add to sprouts. Remove pits from olives if they have them, then leave them in halves or rough chop. Add the olives and Parmesan to the sprouts too. In a small bowl, whisk together the lemon juice, olive oil, Dijon, garlic, salt and pepper. Mix dressing into sprouts mixture until evenly coated. Serve! Leftovers will keep well in the fridge for 1-2 days, and longer if not dressed. Notes: I like pitted green olives as they usually have more flavor, but pre-pitted and/or pre-sliced green olives would be ok here. To extract the pit, carefully push down the flat side of the knife on the olive to crack it open, then just pick out the pit. You could use black olives, but I don’t think the salad would be as good honestly.